The DCC Sports Hall of Fame was established by the DCC Alumni Association through the efforts of the DCC Alumni Council in 2011. Induction ceremonies were held in Oliver Hall in Temple Building in May with lunch reception following for 2011 and 2012 induction ceremonies. In 2013, the ceremony was moved to the Silverman Auditorium with dinner reception following in Foundation Hall’s commons area. Inductions can include up-to-three individuals or two individuals and a team induction. 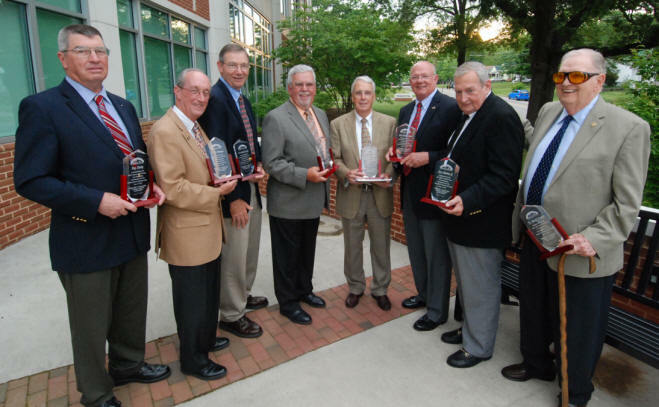 Inductees through 2015 include: 2011 - H. F. Haymore, Pat Daly, Dr. Harold Henry: 2012 - Dr. Grady Tuck, George (Buddy) Clayton, Dr. Shirley Primiano, 2013 - Dr. Ed Polhamus, Jesse Meadows, Jr., the 1964-65 Danville Technical Institute Basketball Team composed of Dr. Harold Henry, athletic director; Dr. Grady Tuck, coach; Fred Butler, George (Buddy) Clayton, Bob Conner, Ray Dooley, Roger Hill, Jesse Meadows, Danny Ross, James Tate, Norman Tiglio, Curtis Tweedy, Albert Thomas Jimmie Wood; 2014 – Dennis Carter, Roger Lee Cook, and Bobbie Reid Hall Ingram; and 2015 O. Bruce Burnett, Jean Styers Rogers and Joseph M. Carr. Honorees will include students, players, supporters, and coaches, from Danville Technical Institute, Virginia Polytechnic Institute—Danville, and Danville Community College, whether involved in college sports or professional/personal sports endeavors—posthumous awards can be made. No person will be inducted more than once into the hall of fame; the individual will either be inducted as an individual or as a member of a team, but not inducted more than once. Up to three honoree positions can be chosen yearly, whether a team or individuals. One of the honorees can be a group, such as a complete team. If an individual team member has already been inducted into the Sports Hall of Fame, then he/she will be invited to the event as teammates are inducted into the Hall of Fame and will be recognized as already being a member. All nominees must have completed 12 credit hours with a 2.0 cumulative GPA, if former DCC students, provided academic records are available for determining GPAs. If there is a question about nominees’ academic records, Sports Hall of Fame Committee members will have the final determination of eligibility. Students or athletes must have been away from the DCC academic setting for five years. Honorees must be able to attend the ceremonies except for family emergencies beyond control, unexpected illness, and deaths in the family. If the honoree cannot attend because of other reasons, his/her name will be held for a year and an alternate honored. News releases on honorees - see links on right. The 2013 Sports Hall of Fame inductees. They are Fred Butler, Dr. Ed Polhamus, Ray Dooley, Jimmie Wood, Dr. Grady Tuck, George (Buddy) Clayton, Jesse Meadows, Jr. and Dr. Harold Henry.